Begonia Dragonwing Red - Brad's Bedding Plants, Inc.
Place these bold beauties in pots, baskets and beds and watch them fill in fast! 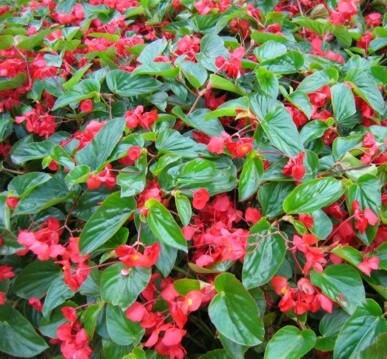 Exotic Dragon Wing Begonias boast loose clusters of Red or Pink bell like blooms. Glossy, dark green, wing shaped leaves frame the flowers. These large, bold plants tolerate heat and thrive in partial to full shade or filtered sun. Dragon Wing is easy to grow and virtually carefree just plant and stand back!